Hanoi (VNA) – President Tran Dai Quang congratulated outgoing Ambassador Herminio Lopez Diaz on the latter’s successful term in Vietnam while receiving the Cuban diplomat in Hanoi on August 28. He said in the four-year tenure in Vietnam, Ambassador Diaz became a trustworthy bridge linking the two countries’ Party and State leaders and is also a close friend and effective partner of ministries, sectors, socio-political organisations and localities in Vietnam. Vietnam-Cuba relations are special and exemplary ties set up by late Presidents Ho Chi Minh and Fidel Castro and nurtured by generations of leaders and people of the two countries. The Vietnamese Party, State and people always keep in mind Fidel Castro’s contributions to bilateral relations, President Quang said. “Cuba is always deep in the heart of each Vietnamese people,” he stressed. 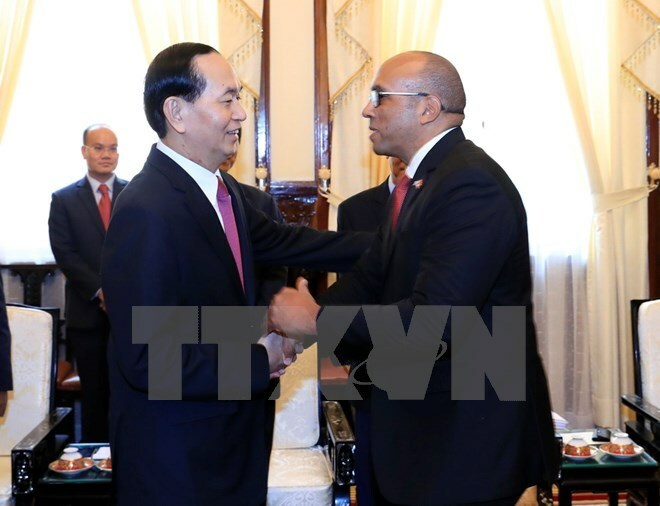 He expressed his delight at the thriving solidarity, comprehensive cooperation and mutual trust between the Vietnamese and Cuba Parties, States and people, congratulating the Latin American country on its socio-economic and diplomatic achievements over the past years, particularly in the update of its economic model. The President affirmed the Vietnamese Party, State and people’s consistent support to Cuba in all spheres, adding that they are ready to share all experience in the three decades of reforms with Cuba. On this occasion, he also asked the ambassador to convey the invitation to visit Vietnam to Cuban President Raul Castro. At the meeting, Ambassador Diaz delivered the Cuban Party, State and people’s congratulations on the 72nd National Day of Vietnam, stressing that Cuba will exert every effort to nurture the exemplary relationship between the two countries. Briefing his host about the outcomes of his term in Vietnam, the diplomat appreciated President Quang’s contributions to bilateral ties.